The Canadian Grand Prix comes with a high risk of Safety Cars, and the teams’ strategists plan for at least one SC outing every Sunday at the Circuit Gilles Villeneuve. There wasn’t long for the strategists to wait during the 2017 race, with Felipe Massa and Carlos Sainz shunting on the first lap and bringing Bernd Maylander out of the garage for his first run of the day. Sainz was clipped by Romain Grosjean as the Toro Rosso approached Turn 3, and the Spanish racer was little more than a passenger as his car spun into Massa, taking both men out of action before the first racing lap was complete. Grosjean did not emerge unscathed from the incident, and was forced to pit for a new front wing thanks to the damage incurred, but the Haas driver was able to continue running, albeit further down the field than where he started. The Safety Car remained out till the end of lap 3, and racing resumed on 4. 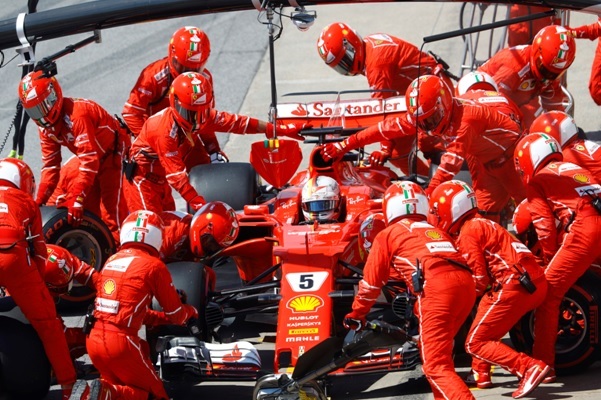 It was on the restart that Vettel’s race was rewritten, with the Ferrari driver damaging his front wing badly enough that he was forced to pit from fourth place at the end of lap 5, returning to the field at the back of the pack and necessitating a fightback from the championship leader. 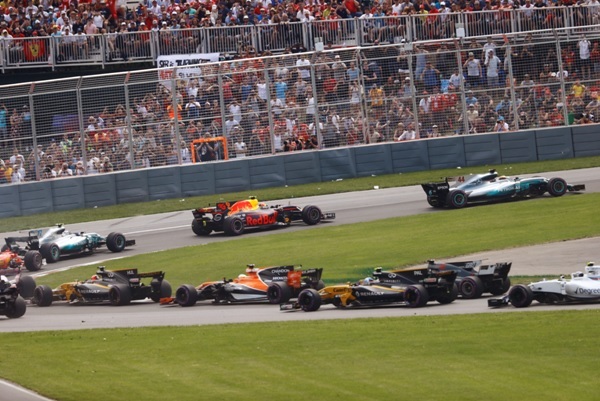 From the three-way first lap shunt that brought out the Safety Car to Kimi Raikkonen’s near-miss with the Wall of Champions, the 2017 Canadian Grand Prix was an action-packed Montreal classic, and just what Formula One needed after yet another overpriced Monegasque parade. McLaren looked set for a reasonable result until the dying laps, with both Fernando Alonso and Stoffel Vandoorne able to battle rivals in the corners -- even pulling off the odd overtaking manoeuvre -- before being overhauled on the straights thanks to their woefully underpowered Honda engines. Alonso was on track to score the Woking outfit’s first points of the season, but with three laps remaining the Spanish racer’s car gave up the ghost and yet another race went unfinished. Lance Stroll delivered an F1 career-best performance, spending chunks of the race in a three-way fight with Kevin Magnussen and Nico Hulkenberg, and the teenaged racer even managed to pass Alonso for a points-paying position -- a place Stroll was able to hold until the end, securing his first points of the season in the process. 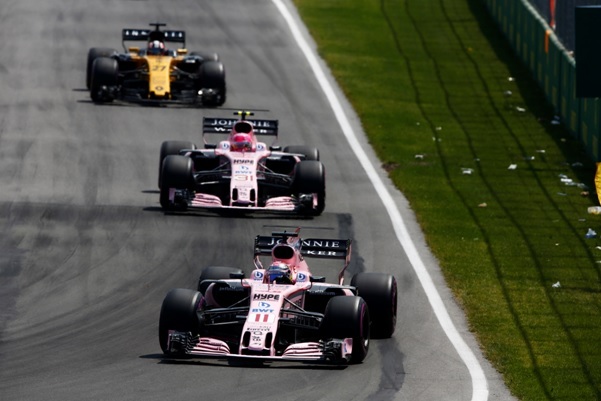 Less happily, Force India drivers Sergio Perez and Esteban Ocon appear to be at war following Perez’ decision to ignore team orders when asked to give his rookie teammate a chance at overhauling Ricciardo for a podium finish. "The best I can do is give plenty of points to [the team], as I have in the past,” Perez said. “I think we got the most we could, and Esteban had many laps to overtake me, but he was not close at all. I couldn't get Ricciardo, so I don't think he would have got him. Daniel was very strong on traction. When the team asked me to give the position to Esteban we were about to lap some cars ahead of us. And I thought that Daniel might get traffic, and I only need two to three tenths to get the opportunity on him, and I could see he was struggling and I knew the Ferraris were coming." The bulk of the drama during Sunday’s race came courtesy of championship leader Sebastian Vettel, who found himself running at the back of the pack after being forced to put for a new nosecone thanks to damage incurred on the Safety Car restart. Vettel’s early stop put the German racer 18th out of eighteen runners, and the bulk of Sunday afternoon was spent watching the quadruple world champion deliver a classic charge through the field, desperate as he was to minimise the impact of a bad day on the outcome of this year’s championship fight. Having stopped on lap 5 while running in fourth, Vettel had a lot of ground to make up. By lap 14, the German had made short work of Pascal Wehrlein and Romain Grosjean -- among others -- and was running in P13. By lap 18, Vettel was back in the points, and five laps later the Heppenheim native was in a comfortable eighth place. But running for forty-odd laps on tyres not meant to go that sort of distance meant that Vettel was forced to make a second stop on lap 49, dropping from sixth place to seventh and putting him behind the battling Force India pair. Vettel hung on to the fighting duo and took advantage of the internal struggles to slip past Ocon when the Frenchman slipped up at the chicane. When the chequered flag fell, Vettel crossed the line in fourth place, and retained his lead in the drivers’ standings.